The fats, oils, and grease (FOG) found in food ingredients such as meat, cooking oil, shortening, butter, margarine, baked goods, sauces and dairy products is a major concern for the City of Dothan’s sewers. When not disposed of properly, FOG builds up in the sewer system constricting flow, which can cause sewer back-ups into homes and sanitary sewer overflow discharges onto streets in your community. 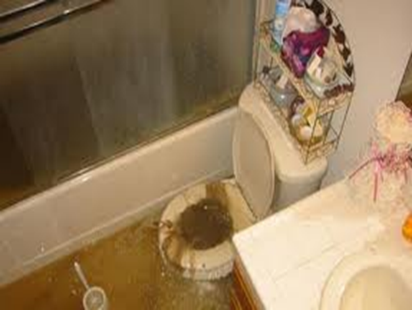 Sewer backups into homes create a health hazard as well as an unpleasant mess that can cost hundreds and sometimes thousands of dollars to clean up. In certain parts of the City, FOG resulting from improper disposal or sanitary sewer overflows can enter storm drains and/or flow directly into water bodies creating serious environmental and health conditions. It can also interfere with sewage treatment processes at the City’s wastewater treatment plants. To remediate (remedy) this problem, the City has developed a FOG outreach and education program aimed at eliminating FOG from the sewer system. Homeowners can help too by not pouring cooking grease down the drain causing their own drain lines and the City’s sewer to clog. Running hot water is not a solution to prevent grease blockages since it cools quickly. 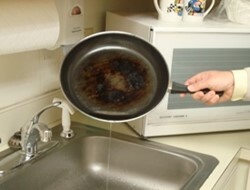 Preventing grease from entering any drain in your house is the solution. Be a good steward of the environment and a considerate neighbor. Another major source of FOG is from the use of waste food grinders (garbage disposals). By doing away with the use of waste food grinders, a major cause of FOG related plumbing stoppages in residential dwellings and a source of FOG discharges to the City sewer will be eliminated. Also home owners can recycle there used cooking oil. Although the City does not currently offer a recycle program, residents are encouraged to contact local restaurants to enquire about disposing of used cooking oil in their grease recycle bin. Stop FOG from being a costly nuisance to you, your neighborhood, your environment, and the City. A “Residential FOG Control PowerPoint Slide Show (Animated Kiosk) is available for download. Click here. To view or download “Frequently Asked Questions by Residents” click here. Also, the FOG Program is available to give a “Residential FOG Control PowerPoint Slide Show” presentation to civic groups upon request. For more information, please contact Robert L. Hunter at 334-615-4458. Here will find interesting things just for your information and fun. The City has a few games, puzzles, and even a coloring book for the little ones. Enjoy! Click here to view and download.